Analysis WebNotes is a self-contained course in Mathematical Analysis for undergraduates or beginning graduate students. The site is organized into chapters and classes. There's also a set of homework exercises. If you're searching for information on a particular area (say, uniform convergence) or a particular result (like the Mean Value Theorem), try the full chapter index or else the index of results. If you're planning on using the site for a course, or to learn analysis on your own, then you may want to work through the sixty classes in the site in order. Mathematical Analysis studies everything that involves limits. So it looks back at the material you learned in calculus, and explains why calculus works. At the same time, a course in analysis looks ahead to more advanced mathematics, such as topology, Fourier analysis, the theory of differential equations, complex analysis, etc. 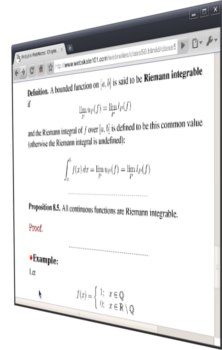 Analysis is a proof-based subject, and so this site is full of theorems and their proofs. If you're interested in pure mathematics and want an introduction to proof-based mathematics, analysis is a great place to learn, because many of the results you see are close to things you've probably already seen in calculus.